The sixth annual RESPONSIBALL Ranking was published today. It presents the social responsibility scores of the first division clubs in several top-level football leagues. The top three positions in the Ranking remain unchanged from last year. The clubs that were promoted to the Dutch Eredivisie league at the end of the 2014/15 season – NEC, Roda and De Graafschap – only served to solidify the Netherlands’ dominance at the top of the Ranking for the second year in a row. If the rise to first place in 2014 of the Danish Superliga clubs was a surprise to some, their “bouncebackability” has been clear to see in the consecutive two seasons: they again finish a strong second, with the English Premier League clubs close behind in third. We are starting to see a growing number of football clubs and organisations begin to use international social responsibility (or ‘sustainability’) standards to report on their performance. SC Corinthians Paulista, Djurgårdens IF and VfL Wolfsburg were among the first; then the governing bodies UEFA and FIFA began using the frameworks to report on the social, environmental and economic impact of EURO and World Cup tournaments; and now we’re also seeing the likes of the two Italian giants AC Milan and Juventus, as well as FK Austria Wien publishing reports. Professionalism is, in many respects, the foundation of social responsibility within an organisation – the values that a professional (and responsible) club projects no doubt contribute to attracting supporters. LA Galaxy (MLS) runs a Protect the Pitch initiative, which focuses on community involvement, energy efficiency, water conservation, waste and recycling, and transportation. Also noteworthy, is the rise in overall social responsibility score of the Spanish La Liga (up 17.34% to 34.28%) and French Ligue 1 (up 11.56% to 26.23%) clubs. 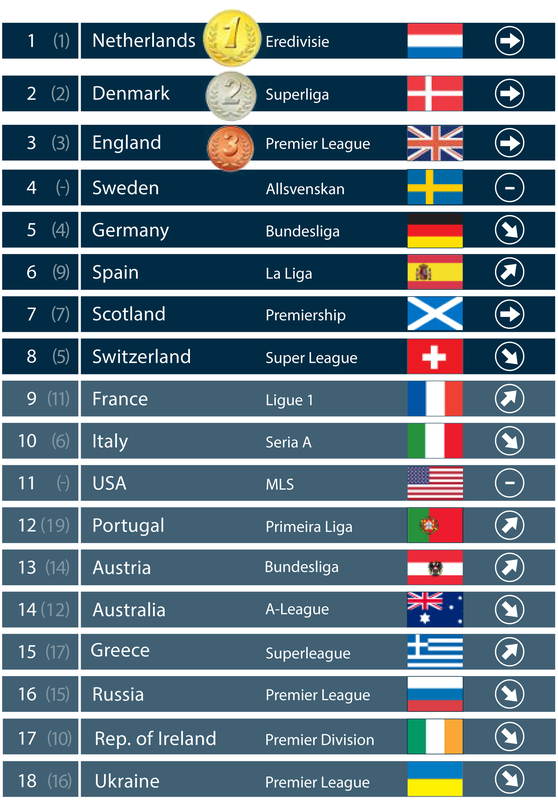 Akin to sleeping giants in RESPONSIBALL Rankings of past, the overall social responsibility scores of clubs in these leagues are beginning to reflect their prowess on the pitch. Clubs such as Atlético Madrid and Barcelona in Spain and Olympique Lyonnais and OGC Nice in France have had historically high scores in this Ranking; this year others join them.